Burkhanism or Ak Jang is a new religious movement that flourished among the indigenous people of Russia's Gorno Altai region (okrug) between 1904 and the 1930s. Czarist Russia was suspicious of the movement's potential to stir up native unrest and perhaps involve outside powers. The Soviet authorities ultimately suppressed it for fear of its potential to unify Siberian Turkic peoples under a common nationalism. Burkhanism is the usual English-language scholarly name. One of the Burkhanist deities is Ak-Burkhan, or "White Burkhan." 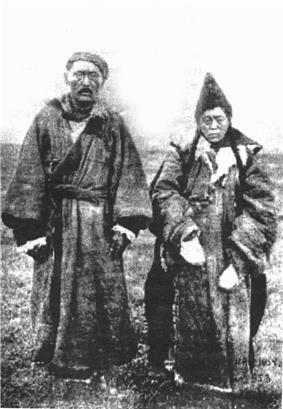 Burkhan means "god" or "buddha" in Mongolic languages, yet Burkhanism is not considered Buddhist, as the term is also used in shamanistic nomenclature. For example in Mongolian Shamanism, the name of the most sacred mountain, the rumored birthplace and final resting spot of Genghis Khan, is also Burkhan Khaldun. Ak-Burkhan is only one of a pantheon of deities worshiped by Burkhanists (see list below), but Ak-Burkhan nevertheless provides the name of the religion in Russian, and thence into other languages. In April 1904 Chet Chelpan (or, Chot Chelpanov) and his adopted daughter Chugul Sarok Chandyk reported visions of a rider dressed in white, and riding a white horse. This figure, whom they called Ak-Burkhan ("White Burkhan"), announced the imminent arrival of the mythical messianic hero Oirat Khan who was actually a real historical figure—Khoit-Oirat prince Amursana. Chet and Chugul gathered thousands of Altaians for prayer meetings, initially in the Tereng Valley. These were violently suppressed by mobs of Russians. Chet and Chugul were arrested, then released in 1906 after the faith was shown to be no threat to the czarist government. Researcher Andrei A. Znamenski (see article below) compares the Burkanist movement to other indigenous revitalizing movements around the world, such as the Native American Ghost Dance or the Melanesian Cargo Cult. In this case, he says, the prime motivating factor was Altaians' fear of displacement by Russian colonists, Russification, and subjection to taxation and conscription on the same basis as Russian peasants. After the arrest of Chet and Chugul, Buddhism through his years as a translator in Mongolia, Tyryi added a number of Buddhist trappings to Burkhanist ritual, such as bells. Within a decade, most of the Altaian population had joined the new faith. Burkhanism accepts the "three worlds" of Mongolic and Turkic tradition. (These are the upper, middle, and lower worlds—in other words heaven, earth, and the underworld.) However, it rejects worship of traditional deities associated with the underworld. In addition, it imports into cultic worship many figures from Altaian oral epic lore, which were not worshipped in the "shamanic" part of the Altaian religion. Shunu ("Wolf")--the Altaian version of Ashina, the totemic lupine ancestor recognized by various Turkic peoples.